It's coming out a little late, but that is only if you expect a theme to come out at the beginning of the month and I'm not entirely sure when Joomla Bamboo usually release, so I'm going to sue this time of the month as the usual from now on. But this one is lovely again, and the image to the right might look a little strange,but it's supposed to because it's a left aligned theme out of the box and we've not seen one of these in a while. Add to that the design features and the options you've got at your fingertips, this one is lovely. 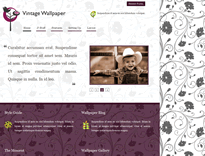 For a demo of this theme or more information, click here.